The Mariners Trail bike and foot path is a wonderful seven mile trail running along the shore of beautiful Lake Michigan, connecting the cities of Manitowoc and Two Rivers Wisconsin. This 10-year old trail features telescopes, sculptures, picnic areas, gardens, and restroom facilities. Along the way you can visit local restaurants and shops, as well as lighthouses along the Lake Michigan shoreline. Thousands of people use the Mariners Trial for biking, in-line skating, running or walking along its smooth asphalt surface. 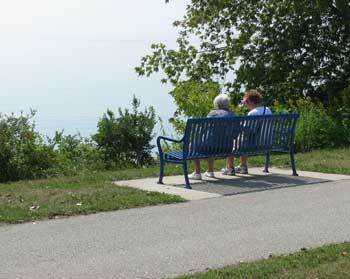 The Trail is free to all its users and is a great place to spend the afternoon no matter what time of year. Parking is available at both ends of the trail and along the trail and has disabled access. The Mariners Trail connects to the Rawley Point Bike Trail at Neshotah Park in Two Rivers...five miles of hard-packed limestone that winds through pines and hemlocks. 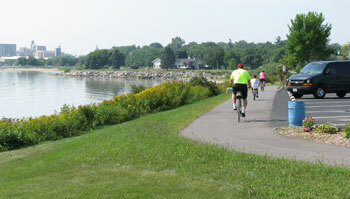 This trail is located within the Point Beach State Forest, over 2,900 acres near Two Rivers, Wisconsin. The forest boasts six miles of Lake Michigan coastline with two campsites and the Rawley Point Lighthouse. There are also 11 miles of trails within the State Forest that includes the Nature Trail, Ridge Trail, Ice Age National Scenic Trail and Red Pine Trail. The Snowmobile Connector Trail is widely used during the winter months. Click here to get a map of the trail. If you are looking for other things to do in the Manitowoc/Two Rivers area check out our Things To Do category.